I’ve adapted the recipe from here and changed a few things while making the cake according to my understanding with baking. Availability of the ingredients is another thing, most of you would agree with me that we don’t get all the baking stuff easily in India, either we’ve to buy them from a gourmet store or have to look out for them online. Due to this reason, I replaced a few ingredients here from the original recipe so that you too can bake this cake with easy ingredients. 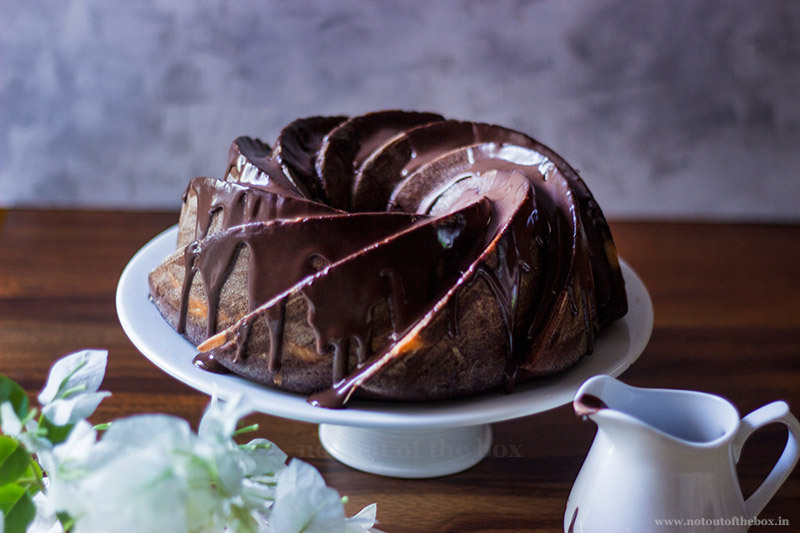 There is no difference between eating a piece of dark chocolate and having this cake, with a hint of coffee the indulgence is, even more, better. 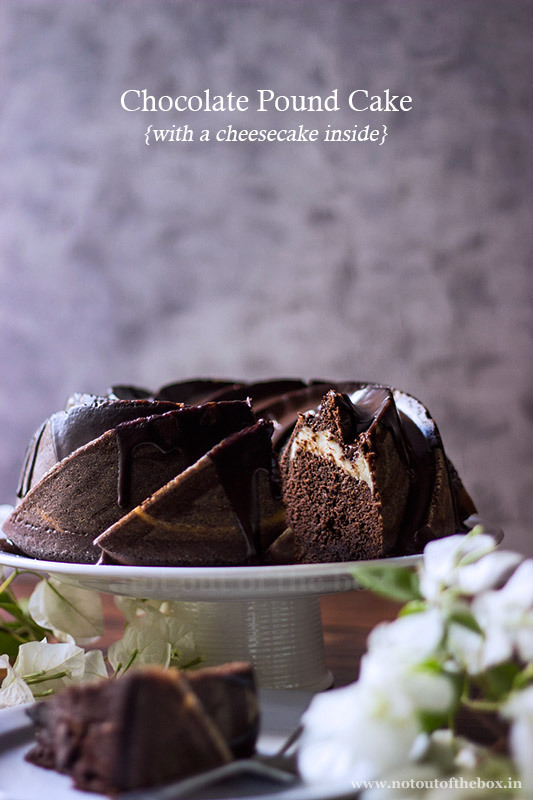 The moist, tangy layer of hidden cheesecake acts as a surprise to whomever you’re going to serve it, you’ll be delighted to see the happiness in their eyes and I was flooded with so much appreciation that I’m already tempted to bake this once again. Go for it and I would love to hear your experience. In a bowl, add cream cheese, egg, vanilla extract and sugar. Whisk well and keep aside. Preheat oven to 176 degrees C. Grease a 2.4 litre Bundt cake pan (I used my Nordic ware Heritage Bundt pan here) using a pastry brush with melted butter. Or, use a lecithin free baking spray. Make it sure to coat all the nooks in the pan, this ensures an easy release for the cake with the sharp design intact. If you’re not using a Bundt pan, then use a 10” cake pan by greasing with butter and place a piece of baking paper at the bottom of the pan. In a bowl, sift all-purpose flour and baking powder. Add salt, mix well and keep aside. In a bowl, add chopped chocolate, coffee powder and cocoa powder. Add boiling water into this, don’t stir. Cover the bowl and let it sit for 10 minutes. After that whisk the chocolate mixture until lump free. Let it be cooled completely, now add yogurt, whisk well and keep aside. In another bowl, cream butter and sugar using your electronic hand mixer or stand mixer whatever you have. In this add the eggs one by one. Add one at a time and keep whisking. Next to add vanilla extract, whisk well. Now add chocolate mixture and flour mixture into this alternately, start and end with the flour mixture. Whisk the batter until smooth. Pour the Chocolate Pound Cake batter into the prepared cake pan, add a bit more than half of the batter at first. Tap cake pan gently on kitchen counter couple of times to release the air bubbles. Now add the cheesecake filling in such a manner so that it doesn’t touch the edges of the chocolate batter, try to keep it in the centre, this part is tricky. Now pour the rest of the cake batter. Tap the cake pan gently again for 2-3 times. Bake for 50 minutes. Insert sharp knife in the middle of the cake. The cake is ready if the knife comes out clean. If not, bake for some more time, and then check again. Cool the Chocolate Pound Cake in the pan for 10 minutes and then invert the cake gently onto a cooling rack. Let the cake cooled completely, in between start making the glaze. Add cream in a bowl, simmer and stir until completely smooth (no need to boil the cream). Remove from the heat, add dark chocolate pieces into this, wait for 10 minutes. Mix and stir until a lump free glaze forms. Pour this glaze on the cooled cake, allow to set at room temperature for some time. Slice, serve and enjoy! Baking time may vary little bit for different ovens and different sizes of baking pans. Halve the ingredients if you want to bake a smaller cake. 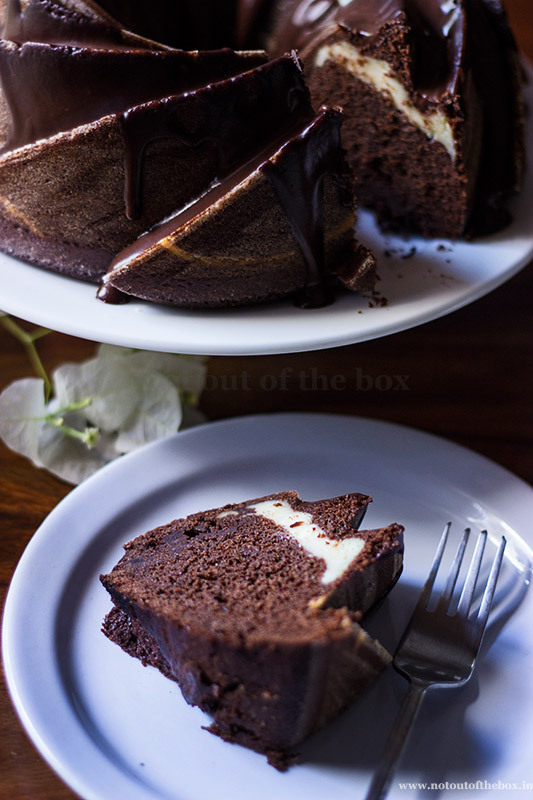 Store the Chocolate Pound Cake slices in an airtight container and keep refrigerated, consume within a week. The original recipe called for 1 full pack of cream cheese (8 ounces), but I felt it would be difficult to layer the cheesecake batter in the centre position if we use a full pack, so I’ve reduced the amount and the batter was easy to manage. Can I make this without the filling?? Looking very tempting. I love chocolates and I also love cheese cake. So this recipe is perfect for me. I will try it whenever I get an opportunity. The pictures that you have shared are very attractive. Hi Vandana! Thank you. 🙂 Hope you’ll enjoy baking it whenever you do, let me know about your experience.